Talk to any startup founder, and they’ll tell you one of the biggest challenges they face is hiring. Finding the right people, convincing them to join the company, and — this might be the biggest piece — making the time to do it. I joined The Penny Hoarder in mid-2015 as employee No. 3, and by the end of 2016 we’d hit 55 employees. That meant finding, hiring and onboarding 50+ employees in just 18 months, and more than half of them in editorial, the department I oversee. 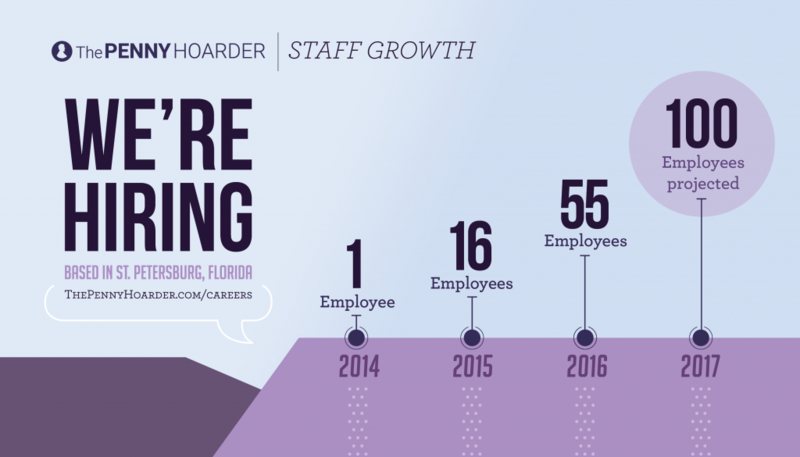 This year, we have more people to help make those hires, including an in-house recruiter. But as I think about how to execute this ambitious plan, I know we need to consider what has worked for us so far, so we can replicate that model going forward. Smart hiring ripples through the company in so many ways, including setting the foundation for a top company culture. Having the money to hire is, of course, the first step. Once you’ve cleared that hurdle, here are some tips for startup founders that will help you scale quickly and bring the right people in the door. Especially if your current process involves receiving applications via email, transitioning to software will change your life. It will cut down on the number of emails and attachments you have to wade through, and make it easy to identify your top candidates. Because if you put any effort at all into circulating your open positions, you will get a LOT of applications. At The Penny Hoarder, we use BambooHR. This HR software makes it easy to create and post jobs to a careers page it generates for you, and if you want even more candidates, it will post to job boards like Indeed on your behalf (for free). When the candidates start coming in, BambooHR lets you rank them, add comments to their profile, toggle quickly between their resume and application info, and even respond directly to applicants right inside the program. BambooHR still has some bugs, but they’re pretty good at incorporating feedback and making requested changes quickly. The tool has enabled us to vet and hire a lot of good people fast. They don’t list pricing on their website; a company representative told me their pricing model varies depending on number of employees and starts at $99/month for up to 12 employees. If you’re not ready to commit to a tool that costs money, Google Forms is the next best thing. Require all your candidates to answer certain questions, and filter those right into a Google Spreadsheet. You can’t attach a resume through a form, but for a lot of digital-focused startups, a resume feels old-school anyhow, and it makes sense to ask for a LinkedIn profile instead. We did this for The Write Life when hiring a Managing Editor, and having all applicants’ info in a spreadsheet made it easy to scroll through, read responses and pinpoint our best candidates. We literally highlighted our top prospects right in the Google sheet and made decisions from there. It’s easy to fall into the trap of vetting on an ad-hoc basis, especially at the beginning when it takes extra time to create a process. But establishing a set of guidelines for hiring will help you move faster in the long run and notice any red flags. And if you truly want to make your life easier from the get-go, ask specific questions in your application. All candidates will send you a resume or LinkedIn profile, but that alone isn’t much to go on in terms of identifying the best talent. Answers to your questions about why they want to work at the company, why they’re well-suited for the job, what they’d want to accomplish in this position — that insight will tell you a lot about each candidate, giving you some real meat to consider as you rank your applicants. You’ll also quickly notice candidates who don’t put much effort into answering these questions, as well as candidates who don’t know much about the job they’re applying for — so you can eliminate them without wasting much of your time. As a bonus, if you’re hiring for a writing-heavy position, answers to specific questions also give you a glimpse into how well the person writes. No matter how well you vet candidates, it’s often difficult to figure out how good they might be at the job — unless you actually see them do that job. That’s why you should ask applicants to do a trial to show you what they’re capable of. Now, I’m not suggesting they come into your office and work for a certain period of time before you actually hire them. While some startups take that approach, it can be an HR headache, and it’s not always possible for applicants who are working a full-time job. Instead, ask them to deliver a product that shows what they can do. We have our editing candidates, for example, take an editing test. This took work up front to create, but it has saved us countless hours and dollars by eliminating candidates who didn’t truly possess the editing chops they touted in their application. For writer applicants, we ask them to write a sample post, which includes pitching ideas to our editors, turning in a draft and working through edits. This gives us an opportunity to see their unedited writing, and also to work through edits with them and watch how well they incorporate feedback. We write in a fun, informal style, and few candidates nail it from the get-go. The real test is whether applicants can incorporate suggestions and nail the voice throughout the editing process. That shows whether they’ll be able to hit it on the head on their own in the future. While some positions easily lend themselves to a trial project, it’s not always obvious what you should ask the candidate to do. In these cases, I often pose the question to the applicant: What might you create that shows us you’re the right person for this position? If it’s a high-level position, the candidate might develop a plan for her first month in the role or even a high-level strategy for the year. When candidates are truly interested in the position, they’ll put the necessary time into that work — and you’ll feel even more confident they’re the right person for the job. At The Penny Hoarder, we offer a $500 referral bonus to employees who refer a candidate we end up hiring. It’s a win-win: Employees benefit from the incentive, and the company gains high-quality employees. We’ve paid four referral bonuses to employees over the last year-and-a-half. While $500 a pop might sound like a lot, it’s a drop in the bucket compared with how much it costs to recruit some candidates when no one refers someone fantastic for the job. Hiring via referrals is also efficient, as it saves us from having to spend a ton of time finding the right candidate or investing in getting the word out about the position. As a bonus, employees referred by others also tend to be awesome additions to the team, because employees wouldn’t recommend them if they didn’t feel confident in the person and their work. Job boards can be a good starting point. But you’ll get applications from more high-quality applicants if you branch out beyond general sites like Indeed. Niche job boards — ones that cover openings in certain industries — are typically more effective: think JournalismJobs, Dice, etc. Know where I’ve had the most luck connecting with quality candidates? Facebook groups. Yup, I figured that one might surprise you. Facebook isn’t meant for job-seeking, you say! But Facebook groups are fabulous for connecting with people who have similar skills or interests, and top performers are typically involved in groups that relate to their specialization. So if you’re able to find the right groups and get approved as a member, you’ll have access to lots of high-quality talent, including passive candidates who aren’t looking for a job. Often, those are the people you really want to target. It’s well worth your time to spend a few minutes looking for appropriate Facebook groups where members have the skills needed to succeed in your open position. Before you start searching, ask staffers who work in that industry (if you’ve hired some already) if they know of any fitting groups to target. If they network with others in similar roles, chances are they’ll be able to point you in the right direction. One other strategy that has worked well for us is LinkedIn ads — promoting jobs by paying per click beyond what we paid for the ads themselves. It’s effective because it targets local candidates, and it’s easier to recruit workers who live locally than convince someone to move across the country for a job. (Our HQ is in St. Petersburg, Florida.) As a bonus, that ad money helps to grow the following on your LinkedIn company page, too. As a founder or executive growing a startup in the early stages, this is something that’s worth spending your time on: bringing in the right people. Have your staffers help you with outreach and interviews — you’ll get different perspectives and garner excitement about new hires even before their first day. But expect recruiting and hiring to take up a significant portion of your personal time, effort and brain space. It’s that important to the success of your company. When you grow a startup this rapidly, you’ll no doubt face other challenging growing pains along the way. But getting the right people to join you is the first step. –> If it’s worth your time to apply for the job, put in the effort on your application! Do your research and think about why you want it. –> Be that candidate who knocks the trial assignment out of the park! It’s obvious when you phone it in. –> If you can tear yourself away from the babies and cats, search for relevant professional groups on Facebook — and you just might find your next job. Great points, Heather — Thanks for chiming in! I agree with Heather, above. Great points! I’m not hiring or looking, but I like reading your posts. (2nd child coming — wow!). One thing I’d add about paying writers/editors to spend their time taking tests (see relevant entry below), employers might be missing great talent if they don’t pay. Many professional writers/editors, including myself, are not going to spend much time working for free, even for a test. I’ve found that the standard practice is to pay. Thanks and happy hiring! Hi Diane — I see where you’re coming from. But I don’t necessarily think employers should have to pay for a trial. If they’re going to USE the trial (for example, if it’s a post for the website), then yes, they should pay. But often trials are never used by the employer other than to judge a candidate’s ability to do the work. In my mind, willingness to do a trial for a full-time job shows you’re serious not just about getting *any* job, but about getting a job with that specific company.